Great news for all fans of gambling and especially for those poker lovers: Texas Hold’Em, one of the most popular poker variations, comes to your Android and iOS devices, thanks to My.Com! Texas Hold’Em is one of the most popular forms of poker among both novices and professional players, and now anyone can join the game in POKER ARENA free of charge! Game supports 10 languages: Russian, English, German, Portuguese, Spanish, French, Arabic, Chinese, Japanese and Korean. POKER ARENA is a good-looking game with user-friendly interface, making it comfortable for both experienced gamers and newcomers. The game supports a wide range of Android and iOS devices, so you can play your favorite Texas Hold’Em anywhere you like – at home or in the office, during vacations or business trips. POKER ARENA is a truly cross platform experience (popular social networks included), so you can literally play poker with all your friends! Each newly registered player gets a gift – 50 000 poker chips! And remember, POKER ARENA is a completely free game! 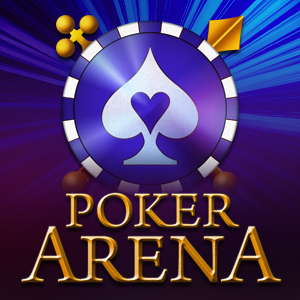 The world of high-stakes gambling and unbelievable victories awaits in POKER ARENA!